Ensuring your bike fits the chosen rack means you won't be 'on the rack'. Bikes and holidays go hand-in-hand. For many, hitching up the van or camper and heading away wouldn’t be the same without a bike to ride once at their destination. But buying the right rack to transport your bike can be a difficult choice. Check out our guide to bike racks and you will be out pedalling in no time. Outside of the towing world, towball and hitch-mounted racks are the most common. They are fitted either on top of the tongue, over the towball or into a square hitch receiver. As a result, in nearly all cases, towing is not possible when using this style of rack. 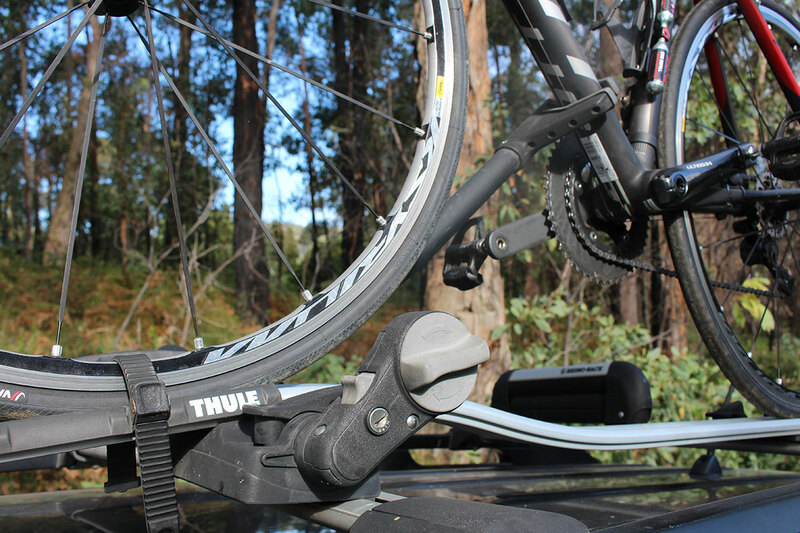 Some racks are A-frame style which allows the towball to be used, however the bike rack will impinge on the van or camper’s drawbar so sharp turns and tight corners will present a major problem and damage to the bike, bike rack, vehicle or van may occur. Most towball/hitch-mounted racks are fairly simple to mount, meaning fast fitting and removal. They are available in a range of designs, fit between one and five bikes, and range in price from under $100 to upwards of $500, depending on features and mounting style. In most cases, these racks will obscure your number plate so don’t forget to purchase a bike rack-specific number plate to mount on the rack. 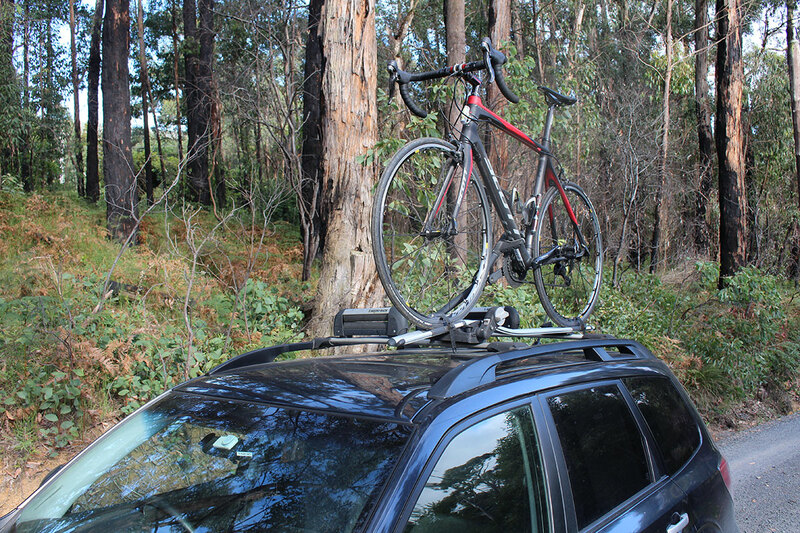 Perhaps the most stylish place to transport your bike, a vehicle roof-mounted rack can be used with or without your RV on the back, however it does require your vehicle to be fitted with roof racks. The roof-mount carrier connects to the roof rack, so purchasing a carrier which is compatible with your roof rack shape is essential. Simple roof-mount carriers require the front wheel of the bike to be removed, while the more elaborate (and expensive) models can transport a bike with wheels still attached. These bike carriers each hold one bike so if you need to carry multiple bikes, ensure you have enough room on the vehicle roof to fit the required number of carriers. Lifting bikes onto the vehicle’s roof can be difficult, especially if the vehicle is high or the bike is heavy. And most importantly, don’t forget to take the bikes off your roof before driving into your garage or under any other low clearances, such as bridges and car parks. Like a vehicle roof-mount, bikes can also be carried on the roof of a van or camper which is fitted with an appropriate rack. While most vans and campers do not come standard with this, it is an optional extra for many. In most cases, a standard car roof rack bike carrier can be fitted to a RV roof rack. 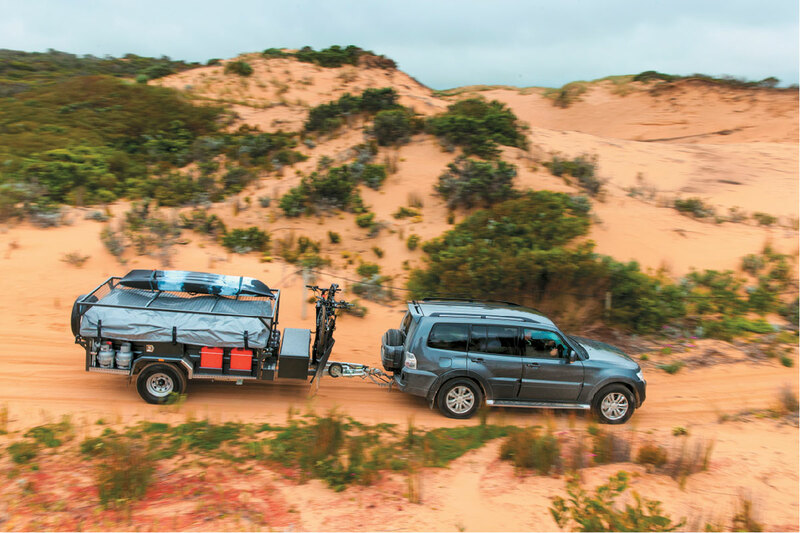 Due to the height, this option is ideally suited to low pop-top vans, or campers with a folding top. Access can also be difficult if the RV is wide and the bikes are positioned towards the centre. So if you have the option, consider attaching the roof rack and bike carriers towards one end of the RV. Carrying bikes at the rear of your RV can help improve fuel economy. 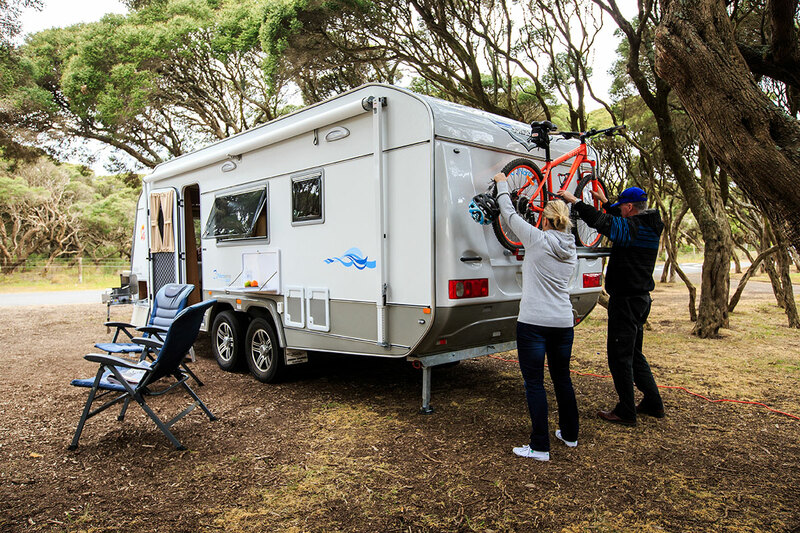 There are various options but the most popular are a rear-wall rack or attaching a bike carrier to a hitch at the back of the RV. 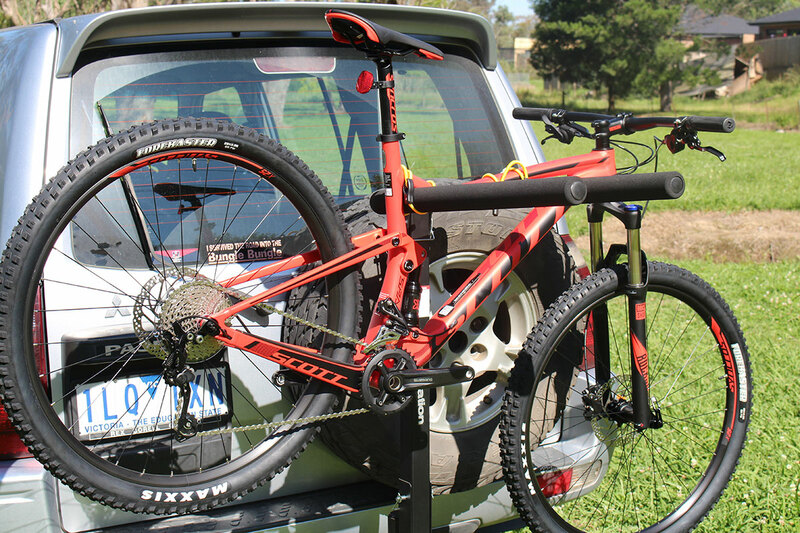 Rear-wall racks can attach to either a spare wheel or on the back wall. The initial installation for these types of racks can be challenging with rear-wall racks requiring mounts to be drilled and bolted to the RV. Some RVs come standard with a rear hitch but, for others, it requires aftermarket fitting. A RV hitch allows you to fit a number of different styles of vehicle racks – as explained above. This option can be very versatile as bikes can be carried on the RV to your destination then the rack can be transferred onto the vehicle once the RV is unhitched. On modern RVs, real estate on the drawbar is becoming a precious commodity. But, if your rig has enough space, a drawbar rack can be a handy way to carry up to three bikes. These racks attach to the drawbar on specific mounts. If space is limited, some drawbar racks have a high design, allowing the bikes to clear any gas cylinders or toolboxes. If you opt for this setup, look for a rack which folds down should you be vertically challenged. With bikes adding weight to the front of the RV, be careful not to exceed your ball weight. You may even need to counter the added weight at the front with some weight at the rear. Not only are there a range of bike rack mounting styles, bikes can be fitted to their carrier racks in a variety of ways. Frame clamp (either on the top tube or down tube), wheel channels, or a combination of these two, are the three main styles. When choosing your rack, consider not only where you will mount it but how the bike will mount to the rack. Different styles of bike are better suited to different racks. Ladies’ bikes with low sloping top tubes often require the use of a telescopic extension bar between the seat post and stem, if you’re using a top-tube frame clamp. In recent years, E-bikes have become a lot more common. The addition of a motor and battery adds significant weight to the bike so make sure your rack can not only handle this weight but you are capable of lifting and fitting your bike. With the plethora of bike frame designs available, always try-before-you-buy to ensure your bike fits the chosen rack easily.